Not worth the money we paid, $50/day for parking, 70/per person for the buffet and the pool was a sad excuse for a pool. Bathroom is extremely smelly. Road noise is intolerable. Staff is professional, service overall is excellent. Issue at the front desk. Agent flagged my account (without saying anything to me about it) and I was unable to bill anything to my room. Quite humiliating given I hosted a large group of family and friends poolside lunch. Overall a nice hotel, but the air conditioner was so loud I could hardly sleep with ear plugs and two pillows over my head. The TV in the room was really crappy too. It had lines all over the screen, kept freezing, the remote didn't always respond. Pleasant, friendly and helpful personnel/staff. Clean areas and room, comfortable bed. Nice hotel centrally located and across the street from beach. Prior to arriving, when inquiring about the status of the strike going on at certain Waikiki Beach hotels I was assured the Hyatt employees were not involved. They were not, that is true, however, the noise was such that we had to be relocated from the Ewa Tower to the Diamond Tower where the noise was lessened. The staff did move our luggage to the new room but for several hours our room was not available to us. The staff did not charge us our resort fees, which was fair, but I feel the noise issue should have been relayed to me when I inquired. On a very positive note, we had superior service from Barbara and especially Sana at the Swim restaurant and Shawn was our server at the buffet. They were top notch and should be considered valued employees!!!! Busy hotel. Great location. Slooow elevators. Pool area staff is fantastic. IT'S THE BEST HOTEL OUT 14TH TIME WE VISITED HAWAII !!!! Great hotel - in front of the beach and close to everything. Friendly staff. They charged somebody else’s bill to my credit card twice. One is still pending even 2weeks after our stay. My wife and I were celebrating our 35th wedding anniversary. The hotel staff were very warm and welcoming during check-in and when we entered our room we found a very surprised to see a special chocolate arrangement on the bed. The buffet breakfast was fantastic and the staff were very friendly. Special thanks to our servers, particularly Brenda and Pam for just treating us like family. We hope to see them all again in the near future. The hotel was great. Literally right across the street from the beach. Staff was phenomenal. Our stay coincided with Hurricane Lane and the staff did all they could in anticipation of the storm even sending up additional snacks to the room being that EVERYTHING was shut down. Thankfully the storm didn't hit our area but again the staff was great with keeping everyone informed. Only downfall I had was that for the price you pay to stay there and an additional resort fee some sort of breakfast should be included with the stay. Other than that the place is amazing from the views to the staff. It is very nice hotel clean and convenient, But is not the room level when I book, I booked nice room with 400 sq feet, When I checked in, room is small, Sure is not 400 sq feet, I call the front lobby, they said is what I booked, I think I won’t book this hotel again. Disappointed during vacation. We had a wonderful stay on Waikiki beach and a big reason we did was due to staying at the Hyatt Regency. Wonderful accommodations and very helpful and responsive staff. We especially appreciated the assistance we received fron the activities desk staff. Very helpful. 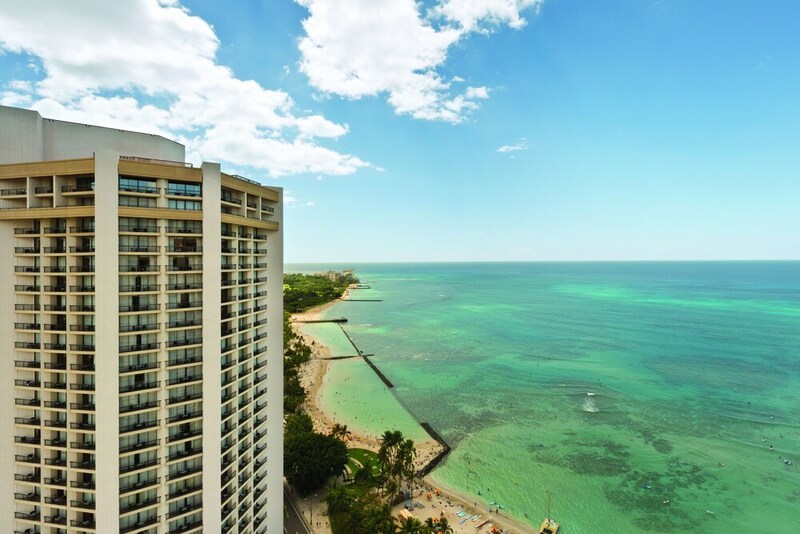 Located in Waikiki, Hyatt Regency Waikiki Beach Resort & Spa is adjacent to Kuhio Beach Park and within a 5-minute walk of other popular sights like International Market Place. This 1230-room, 4-star resort has a full-service spa along with an outdoor pool and free in-room WiFi. Centrally located in Honolulu, the resort is connected to a shopping center and also a short walk from Honolulu Zoo and Waikiki Aquarium. Relish the American cuisine at Shor Restaurant, one of 6 onsite restaurants, which serves breakfast, or enjoy the ocean views at The Buffet at Hyatt. Savor a meal from the privacy of your room with room service, or get a pick-me-up at the 2 coffee shops/cafés. Start each morning with buffet breakfast, available for a fee from 5:30 AM to 11 AM. Guests can expect to find free WiFi and 55-inch a flat-screen TV with cable channels and pay movies. Beds sport premium bedding and the bathroom offers a rainfall showerhead, a hair dryer, and designer toiletries. Other standard amenities include a lanai, an iPod dock, and a coffee maker. At Hyatt Regency Waikiki Beach Resort & Spa, guests enjoy a full-service spa, an outdoor pool, and a fitness center. Valet parking is available for USD 50 per night. Multilingual staff at the 24-hour front desk can assist with concierge services, securing valuables, and dry cleaning/laundry. Other amenities at this beach resort include 2 spa tubs, a sauna, and a conference center. Buffet breakfast is served daily from 5:30 AM to 11 AM for a fee. Shor Restaurant - Restaurant specializing in American cuisine and serving breakfast. Ocean and pool views. Alfresco dining available (weather permitting). Kid's menu available. Open daily. The Buffet at Hyatt - Restaurant specializing in local and international cuisine and serving dinner. Ocean and pool views. Alfresco dining available (weather permitting). Kid's meals available. Open daily. SWIM - Poolside cocktail bar specializing in local cuisine. Open daily for lunch and dinner. Kid's menu available. 2 spa tubs are on site, and the resort also has an outdoor pool. A sauna and a fitness center are other recreation options.